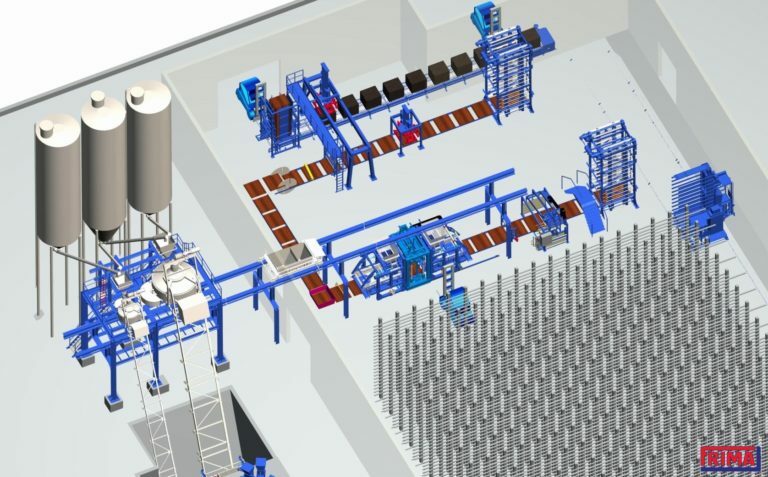 FRIMA creates the system layout for concrete block production in close collaboration with the customers. We adapt the design to their unique production plans and surface conditions. We prioritize future-proofing and economic efficiency. 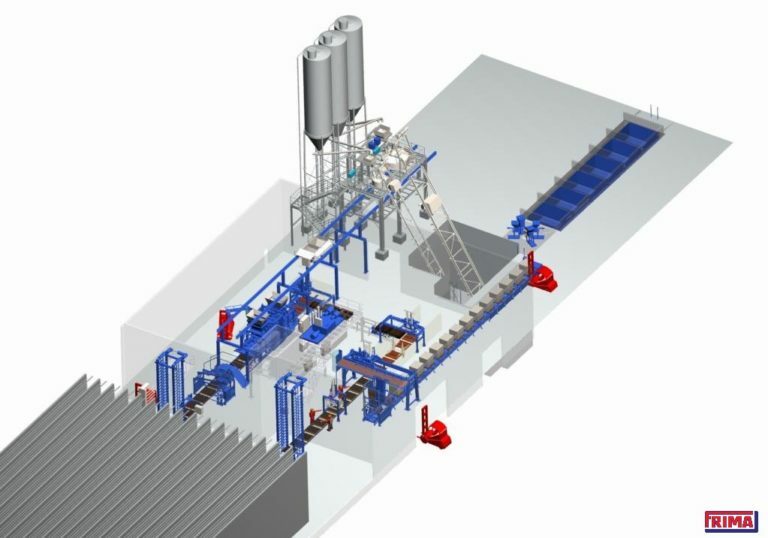 Most of the systems are designed in such a way that the material moves from the silo to the dosing and mixing system via transport systems. The concrete produced there then goes back to the block making machine. From there, the stones pass through the curing system to the packaging system. Finishing systems for the design of the surfaces can be integrated on request. In addition to the individual system layouts, FRIMA also offers economic I and U shapes with a small footprint. "A good system layout? Enables the effective and economical production in the given area." The I-shape is the economical, yet highly effective variant for small investment volumes and small areas. Without chambers or vehicle groups, it is possible to create simple system layouts using boards with feet. 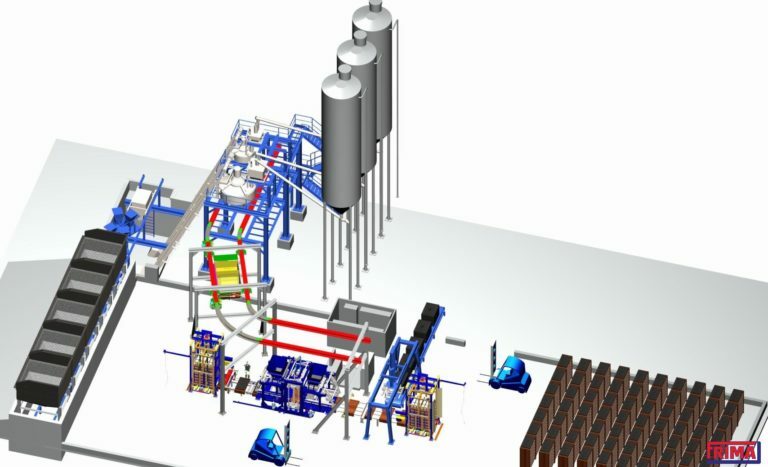 At the same time, the customer has the option of later expanding their production into a fully automated system. The I-shape minimizes the space requirement for concrete block production considerably. As a result, the investor not only saves on the system components, but also on the construction costs (e.g. hall construction, foundations, etc.). The placement of a new system in existing halls is possible with little effort, thanks to the I-shape. If the customer does not want to drive boards with feet, FRIMA can offer specific and cost-effective special solutions. A system layout in a U-shape has transverse board transport. The empty boards go into the system the same place they come out. With this simple system layout, boards with feet can be a very cost-effective option, one that does not require any chambers or vehicle groups. Should a conversion to a fully automated system become necessary, this is possible at any time. For example, a vehicle group can be easily retrofitted with a dry chamber system. Even with the U-shape, the space requirement is relatively low. The advantage: Not only the investment in the system components is manageable. The construction costs are also low (e.g. hall construction, foundations, etc.). A U-shaped system can be integrated into an existing hall with few resources. The so-called circulation is in fact the U-shape system. This system layout has been extended by a transverse board transport compared to the I-shape. The empty boards go into the system the same place they come out. With this simple system layout, boards with feet can be a very cost-effective option, one that does not require any chambers or vehicle groups. Nevertheless, it is also possible for the customer to expand the system into to a fully automatic system. They can, for example, add a dry-chamber system to a vehicle group. This U-shape allows the customer to have concrete block production in a relatively small space. It not only saves money in system components, but also saves on investments in the entire construction project (e.g. hall construction, foundations, etc.). In addition, such a simple layout allows the customer to place a new system in an existing hall with as little effort as possible (e.g. construction space). If the customer does not want to drive boards with feet, FRIMA can offer specific and cost-effective special solutions. In addition to the I and U shapes, FRIMA can customize its system layouts to any shape, thanks to its customer-specific solutions. This means that if a customer has precise ideas for their system, FRIMA can discuss the solution in detail with the customer and then provide a corresponding layout design and corresponding quote. Another approach is to have the customer specify their wants, technical requirements and ideas. FRIMA then incorporates these into the system layout in collaboration with the customer and comes up with a corresponding quote. In both cases, FRIMA is generally in the position to submit any system layouts to the customer as long as they are technically feasible.